Atlus has confirmed that a big a Persona-related announcement is coming this Sunday. With only a few days left before it expires, Atlus has confirmed that the deadline posted on a vague teaser site the company created back in September is, in fact, the prelude to a new, big announcement involving its Persona series. While many franchise fans had been hoping the news might be the announcement of Persona 5 however, evidence is now stacking up in favor of new content involving Persona 4. Yesterday, for instance, we reported that imagery from Persona 4 had been added to the teaser site. Now, a countdown page has been created by Atlus featuring similar visuals. More importantly, however, it's been discovered that Karen Strassman, who did voice work for the character Nanako in Persona 4, has listed credits for "Persona 4, Vol. 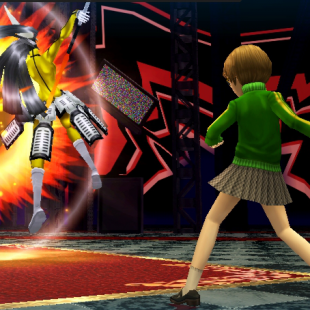 2" as well as "Golden 2 Persona 4" on her online resume. This would be the first mention of such titles that the franchise's fans have spotted up to this point. Currently there's still no telling what Atlus will announce when the timer counts all the way down on Sunday. That said, the current signs seem to be pointing toward a direct sequel to Persona 4 which could be good news or disappointing depending on how you feel about the series. Just personally, I'm coming to the end of my first run through Persona 4: Golden and, while I love the characters and would enjoy seeing more of them, I will admit to hoping for something completely new. The Persona team has just demonstrated itself to be a talented bunch in the past and I look forward to seeing what they can come up with next.